The end of another busy year, once again with some extremely enjoyable times in the bush in the excellent company of our members and friends and with some small achievements and satisfactions – but also with some real disappointments and frustrations. This is as concise a summary as I could make it! MEMBERSHIP: We welcomed 12 new members and by the end of the year our total stood at 55. We lost some who left town or found other interests and mourned the deaths of Roger Chandler and Madge Sceriha. COMMUNICATION: 36 new permanent posts were published on the blog, including monthly updates and trip reports. All were distributed widely beyond our membership. Other articles reported on members’ own wildlife observations and on conservation work being done just to our north. With permission we reprinted material from other sources on a disturbing cassowary incident (near Innisfail), the discovery of new mangrove species (Cairns), and the need to watch out for the aquatic weed Sagittaria, in our own region. Two of us wrote about our experiences in remote areas at opposite ends of the State – Cape York in the far north and Currawinya in the south-west. Other posts paid tribute to Innisfail conservation advocate and fisherman Martin Cunningham; drew attention to rampant tree-clearing across the state; refuted a hysterical anti-bat newspaper article and revealed an unprecedented death toll of flying-foxes at the Dan Gleeson Gardens nursery colony. Thank you Denise for writing three articles, Laurie and Margaret for contributing interesting material and everyone (especially Malcolm) for their great photos! 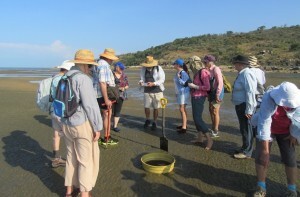 FIELD TRIPS: Our 10 field trips embraced indulgence (Zoe Bay cruise) and hard work (a northern beach clean-up). Other destinations ranged from the local Anderson Park to the more distant but historic Kennedy Bay. We went south (a little bit) to Mt Elliott’s Cockatoo Creek and north (a little bit) to Big Crystal Creek. We almost gate-crashed a bush wedding as we explored tracks behind Toomulla, found few butterflies but plenty of koalas on Magnetic Island. We trod new ground on unfamiliar tracks at Mt Spec and, with marine biologist John Collins as our expert and engaging guide, uncovered strange creatures as the tide receded at Pallarenda’s Shelly Cove. Average attendance was 14 people per trip, the most well-attended being the day on Magnetic Island, followed closely by the trips to Zoe Bay and Shelly Cove, all with over 20 attendees. 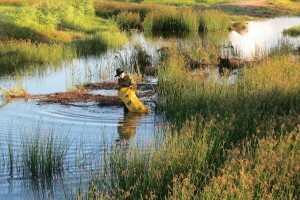 Vegetation management: This issue dominated the first half of the year as shocking statistics were revealed on the scale of clearing and the terrible impacts on wildlife. The Queensland Government ramped up its campaign to restore the controls scrapped by former Premier Newman and was supported by conservation, natural history, wildlife and wildlife care groups across the state. Our Branch made a submission, encouraged members to do likewise and attended the parliamentary committee hearings. Due to the make-up of parliament the reforms were blocked by one vote – a dark day for our fauna, soils, waterways and reef. 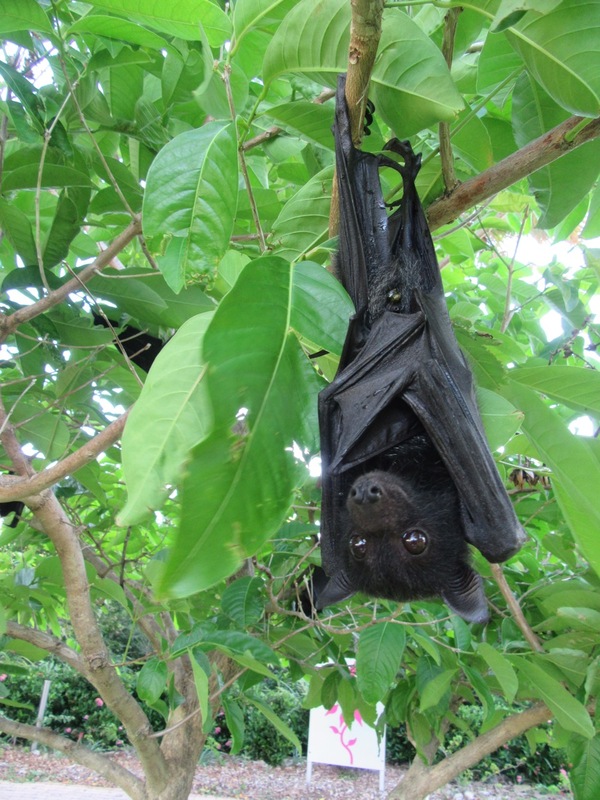 Flying-foxes: Our work with the City Council’s Sustainability Services unit (ISS) on developing interpretive material for the Palmetum flying-fox colony seemed to be progressing slowly but well. In March I joined Dominique Thiriet from NQ Wildlife Care to meet with the Botanics curator, ISS and marketing staff to discuss signage design, images and other creative ideas to promote the colony and encourage greater community understanding and acceptance. This was followed up by an onsite meeting, at which WQ committee members Denise and Beth were also present. Six weeks later came the bombshell – a reversal in Council (TCC) policy which saw dispersal actions carried out daily at the Palmetum from June and continuing right through the breeding and birthing season. No satisfactory explanation or justification for this policy back-flip was provided, nor have we received any information – despite repeated questioning – about the fate of the interpretive project on which we had worked for two years. None of it made sense at the time, and makes no sense now. Furthermore, while the TCC actions effectively held the flying-foxes in the colony at Dan Gleeson Gardens, by preventing them from returning to the Palmetum, they then began dispersal actions there – with an escalation of deaths and abandonment of dependent young, as well as of many adults. Our dealings with QDEHP, which was said to be monitoring the actions, were almost equally frustrating. On a positive note, we produced our own flier dispelling myths and providing accurate information about Townsville’s flying foxes – something that TCC, for all its resources and all its talk of community education, has never done. Nor have they ever assisted, promoted or taken part in any of the 4 bat night events that we co-hosted for the same purpose. It is hard not to be very disillusioned and disappointed, not just by the actions, but by continued failure to answer our questions or provide a logical basis for the policy change. Wildlife monitoring: A small group led by Denise began setting motion-sensitive cameras to see what wildlife could be captured on film. Additional cameras were purchased and several trips were made in the first 3 months of the year to a Council Nature Reserve at Ollera Creek. Later trips were made to private properties at Herveys Range and Oak Valley. Visits to the nature reserve came to a halt when the land surrounding it was stocked with cattle, and padlocked gates, “keep out” signs and barbed wire made access problematic to say the least. This created another issue which we needed to address, see the item below. Straying cattle: Our astute vice-president noticed that while the western boundary of these Ollera Creek properties was fenced to keep cattle from railway line and road, there was plenty of evidence that they were straying onto the beach trampling dune vegetation and potentially destroying nests of birds and turtles. We alerted TCC to the need for action to prevent this and to protect the Reserve from the impacts of cattle. We urged the use of wildlife-friendly fencing around the Reserve, providing information on its effectiveness in both protecting wildlife and containing cattle. (Thanks to our WQ Cassowary Coast colleagues for advice). After months of silence we heard this task had been taken on by NQ Dry Tropics NRM though we have yet to learn whether this fencing has been completed. Pied imperial-pigeons: I am fortunate to be able to continue the Branch’s long tradition of support for the Brook Islands’ population surveys, set by Jo Wieneke and the late Andree Griffin. I took part in 2 counts in 2016 and have had input into discussions to ensure their future at a time of change. Branch sales of the DVD documentary have contributed over $300 to help fund the Thorsborne Trust’s support of the project. Submissions: In addition to the one on Vegetation management, mentioned above, we made submissions on management of protected species, and the amended EIS for the Townsville port expansion. Several members joined the Mundy Creek Landcare group for Clean-up Australia Day in March and in April we again joined NQ Wildlife Care to co-host the Australasian Bat Society’s Bat Night, at the Palmetum. For the third year we had a presence at Ecofiesta in May. While our shady site was not as central as in 2015 we still had plenty of interested people calling by. Our display promoted the need for action on tree-clearing and the importance of flying-foxes. We also advertised our field trips and encouraged interest in our camera-trap surveys, with some success, and possible platypus watch activities, with zero success. Members also attended a Federal Election Forum (June), Environment Minister Steven Miles’ presentation “Reef Conversation” at Reef HQ (August), Sea Turtle Foundation community day at Pallarenda and a Mahogany Glider field day in the Kennedy Valley (both in November). In December a good number of our members rallied against the Adani mine, on the day that Mr Adani and Premier Palaszczuk were in town and 2 members attended an ACF workshop on issues of coal, climate, renewables and reef. After 5 years this is my final report and I thank the Branch for giving me the opportunity to extend my skills and experience beyond anything I considered myself capable of. I feel very sad to be giving it away but reality tells me that I must. While I am proud of having helped to grow the Branch in numbers, influence and range of activities I am aware of how much better we could do and how much more we should do. Much as we enjoy, and learn from, our monthly walks we cannot abandon our wider responsibilities by becoming simply a walking group. We all care and often despair but, as our State President Peter Ogilvie said recently, Unless [those] who care for the environment and its wildlife let their voices be heard, nothing will change.